Wow first post of the year! Where have the months gone by? As usual, some of that time has been spent with me spending (pardon the pun) and in January I have been on somewhat of a YSL spree. I mean since when can you actually nab a bargain from such a high-end brand?? Amazingly, I nabbed 4 in just 2 days! 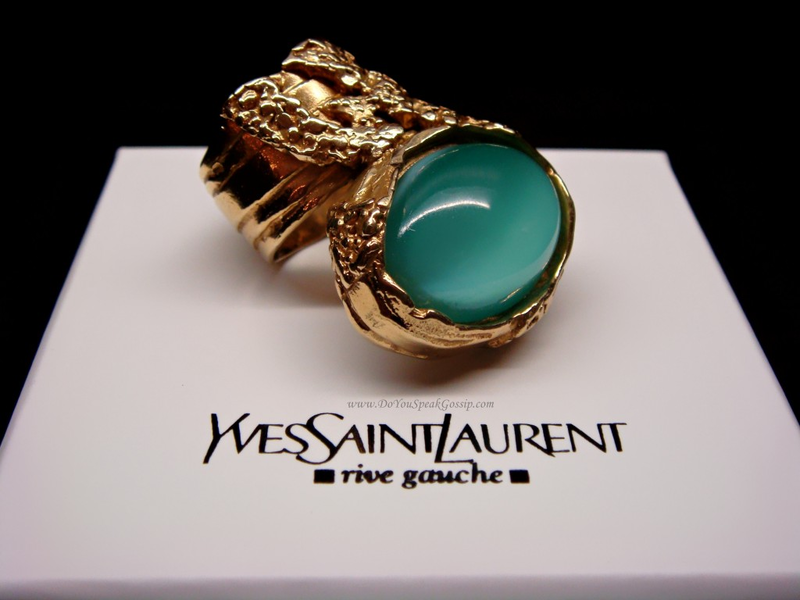 Like most wannabe fashionistas (I do not pertain to actually be that stylish) I have had my eye on the cult classic YSL Arty Ring for over a year now. While I have been eyeing off the navy with gold flecks version (still available at Net-A-Porter here), my second favourite was the Aqua version of the ring, which by some miracle became available for 50% off at Net-A-Porter..and also went on sale on actual pay-day, i.e. it has to have been fate! Well you didn’t have to ask me twice, I snapped this up immediately and all rings were sold out within a day or two. I must say, I am kind of glad I was enticed out of my comfort zone colour wise, because the colour is stunning in real life and will add a real pop to an outfit. Now, the very next day after making my Arty purchase I was told about a YSL Sample Sale in town. It has been a long time since a coveted brand, such as YSL, had a sample sale in Hong Kong and I knew this would be mayhem at best. Luckily I was able to attend the preview for “Friends & Family” of staff, but even then, getting there for the opening there was a line stretching two floors! YSL you are one of the few brands I would brave this for and boy did my determination win out. Leaving the sale with two pairs of HOT YSL high heels. 1) YSL Opyum Pump at $130USD! Retailing for $793USD usually and on sale and sold out on Net-A-Porter for $412USD – what-a-bargain! This is the beauty of being an expat in Hong Kong, my normal Western size average feet are a larger size in Hong Kong, leaving me the best choices at sales. You can see a photo of the actual colour combination (blue and black, my favourite combo) below on nothing less than a Victoria’s Secret Angel, naturally. Doutzen Kroes loves her YSL Opyum Pump’s! 2) While the Opyum Pump will serve me well when power meeting etiquette is required, I couldn’t resist another pair of YSL Sandals, that will be ideal for a night on the town. I don’t know the name of this shoe, but perhaps a less platform version of the famed Tributes. Black and gold are a fail safe combination for dressed up occasions and at $150USD the credit card got another work out. 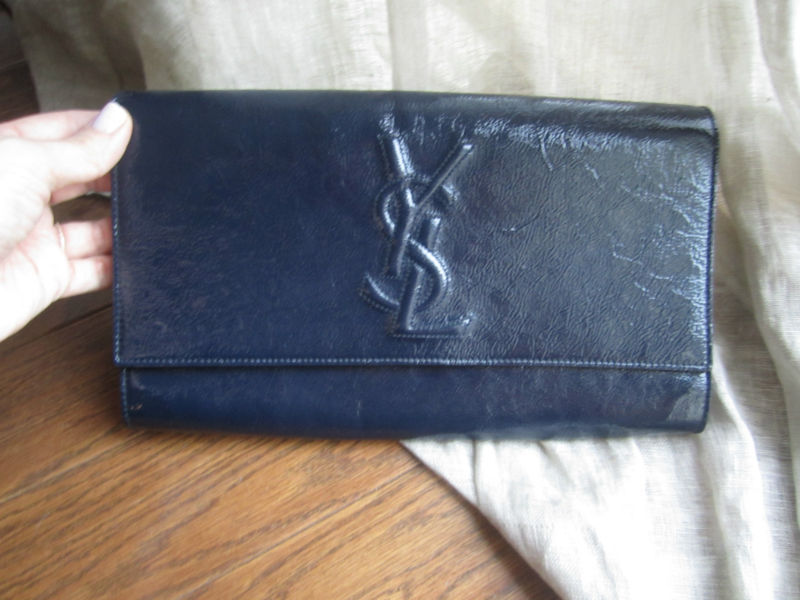 Now having blown my clothing budget within 24 hours of pay-day I definitely resolved that this would be it…until that is, my long-awaited navy YSL Belle De Jour clutch appeared on eBay. Navy is one of my favourite hues; YSL one of my favourite brands; and the Belle De Jour one of my most long desired items..surely I can starve for the remainder of the month for the sake of fashion. And starve I will. The clutch was purchased for $293USD, with a little wear and tear inside (the outside is spotless), considering the clutch retails for $750-800USD (Net-A-Porter selling a few here) I can make do with some dust marks. A celeb favourite owned by everyone from Paris Hilton, Anna Paquin, Dita Von Tesse, Shakira, Emma Roberts, Carmen Electra, Christina Hendricks and Eva Longoria. The classic large black version has been a go to staple for reality stars Kristin Cavallari and Kourtney Kardashian. So much so, she uses it again and again..
As for no-name me, there will be no more YSL for me for a little while, but seeing the brand has been controversially re-branded as Saint Laurent, I am just going to consider these purchases all invest pieces/pieces of history. This entry was posted in Fashion and tagged eBay, Kourtney Kardashian, Net-A-Porter, Saint Laurent, YSL, YSL Arty Ring, YSL Belle de Jour, YSL Opyum. Bookmark the permalink.